The Road World Championships 2011 is about to get underway - and it will be on a route that is among the flattest in the history of the championships. Yet, the course has twists and bumps that may have crucial influence on the race. It is said that everything is relative - and apparently, that goes for World Championship routes, too. Because... well, there may be some truth to the claim that the circuit north of the Danish capital of Copenhagen is flat. There are no Alps. No Norwegian fjelde. No German Mittelgebirge. No Belgian Ardennes. Thus no climbs of the kind that helps to create decisive gaps in the big tours and one day races. Nor is there any cobbles or other foul stuff that can make even a flat stage tough. The circuit consists of 14 kilometers of asphalt which for a seasoned professional rider is pretty much straight forward. But still, there is more to it. 266 kilometers is a lot. Even for a professional. And even a small mound tends to grow in size when it is crossed a certain number of times, and in the case of the professionals, the circuit at Søllerød needs to be ticked off 17 times. The variations on the route - and there are variations - should be seen in the light of this long distance. And when all the legs of the cyclists have completed a couple of hundred kilometers, the knots on the parquet floor begin to show. At that point, the term "flat" should be put in quotation marks, as the riders gradually lose strength. Let us take a closer look at how this is not entirely pancake-like championship route is structured. The professionals' route actually starts in Copenhagen centre. From here it goes northwards to Rudersdal Community where the main part of the circuit is situated. "Commercial breakaways" may well occur on this 28 kilometer long stretch, while the terrain only has a low number of height meters to offer. The real beginning of the races is at Geelskov a little west of Søllerød. The circuit is 14 kilometers long, and is to be ridden clock-wise. The course has, as will be described, several turns, but still its shape is, roughly speaking, oval and lies in a southwesterly-nordeasterly direction. See the page with the Google map of the route! The width of the roads differs a bit: from a three-lane main road to narrow residential streets. And the degree of difficulty in the landscape - which is what we primarily focus on here - is not evenly distributed either. In terms of terrain, the course can be split into two: One part, about six kilometers long with quite a few climbs and sharp turns - we could call this the "tough" part. 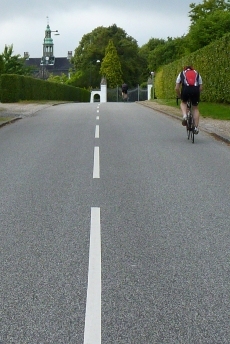 And another part of around eight kilometers which is more straight and less hilly - this is the "easy" one. Note the quotation marks! Let's begin with the latter part of the circuit. It lies on the oval routes southeastern half and starts in the outskirts of Gammel Holte, just before the Helsingør Highway is crossed to the east. The riders go from here along the streets Egebækvej, Rundforbivej and Skodsborgvej ("vej" means street in Danish), before reaching Kongevejen and, in turn, the home stretch. There are two minor climbs - at Nærum - of 9 and 7 height meters respectively and furthermore three 90 degrees turns that shouldn't cause the field too much trouble as they lie on flat surface. In short: These eight kilometers are pretty straight forward. This is where a cooperating peloton has splendid chances of shortening the advantage of possible break-away riders. Also, this is where those who have called this year's championship course flat and boring will shake their head indulgently and state an "I told you so!". However, that changes. At Geelskov the tough section of the route begins - a different and much more varied terrain takes over.